THERE ARE SOME SEATS STILL AVALIABLE. THESE WILL BE GIVEN OUT ON A FIRST COME FIRST SERVE BASES. Martin Dyer, vice-chair of the West Midlands Business Transport Group. Chairing the event is Adrian Goldberg, BBC WM and Radio 5 Presenter. Each speaker will outline their position and then a debate will follow with written questions to be submitted in advance and questions from the audience to be taken on the night. The event is being held at The Banqueting Suite, Birmingham City Council House starting at 6.00pm (debate starting at 6.30pm) and finishing at 8.00pm. 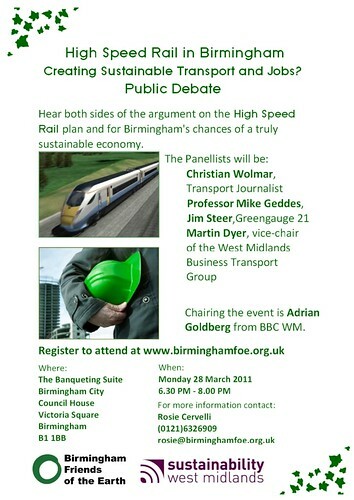 This is a fantastic opportunity to hear both sides of the argument on the HS2 plan and what it means for Birmingham and the environment. This event has limited space, if you wish to come along you must register by following the instructions on the next page. This is a free event, however if you wish to make a donation you can do so on the registration page.